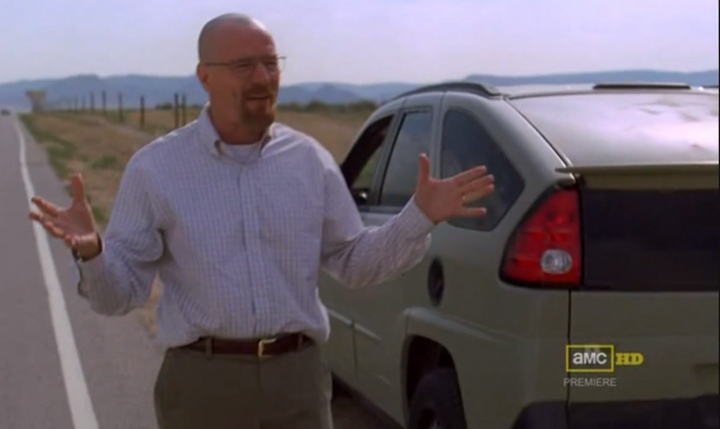 Walter and his Pontiac Aztek. What is the opposite of nostalgia? What is the flip side of the warm and fuzzy association we form with certain images and objects that puts a smile on our faces whenever they’re brought to our attention? If you’re a regular visitor to The Daily Drive (all three months of it so far), then you know we’ve already conjured up well-loved vehicles from the big and small screens in such articles as “FOX Pays Tribute to the Greatest Car Chase of All Time,” “Eight Things I Learned About Cars and Life While Watching ‘The Blues Brothers,’” and “What Would Rockford Drive?”. It’s fairly easy to do because the film and television universe brims with evocative vehicles the way our chunk of the cosmic universe brims with stars. 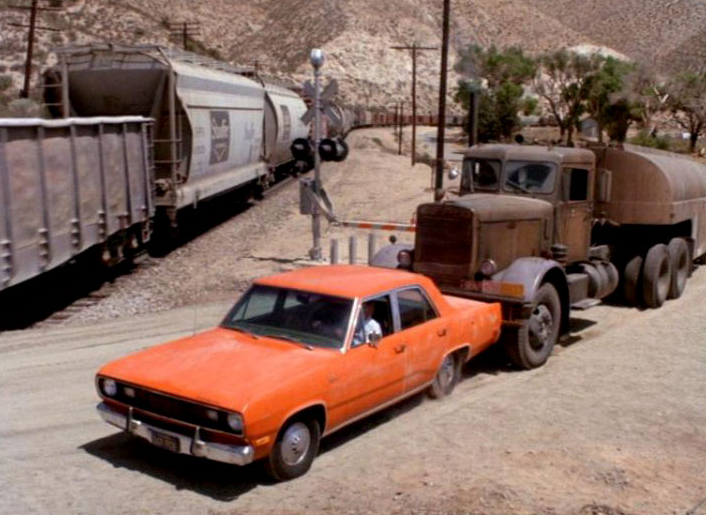 Plymouth Valiant as seen in the movie Duel. But there are some black holes, too. For instance, when was the last time you gave a thought to the fiercely beige ’67 Ford Fairlane 4-door sedan that served Jack Webb’s lead character in the Sixties reboot of Dragnet? Straight-arrow LAPD detectives Friday and Gannon may earned respect by going strictly by the book, but when it came to cool TV cop cars, they were not exactly Starsky and Hutch. That’s just the facts, ma’am. Maybe you thrilled to the heart-pounding action of Steven Spielberg’s directorial debut in the 1971 made-for-TV movie Duel, but what was it that made you feel for the harassed motorist played by Dennis Weaver: That he was being hunted on a desert highway by a maniac in a semi, or that he had to drive an utterly square Plymouth Valiant in which nobody would want to be caught dead? 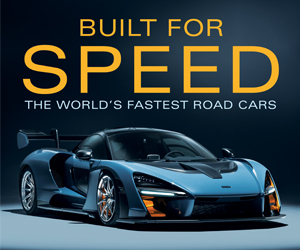 We perk up at the mention of TV’s “hero” cars—the Batmobile, the General Lee—that helped their show’s protagonists win the day, and looked good doing it. But cars like the Dragnet Fairlane and the Duel Valiant are antihero cars. They’re too dorky to enhance the reputation of their drivers—even if they are the “good guys” of the tale. Sometimes even genuine antiheroes drive antihero cars. Cable’s Breaking Bad, a darling of the critics—and, admittedly, your author—is a festival of execrable autodom. (If you’re a recent convert to the show who’s still catching up on past episodes, be warned that I’m about to mention some things you might not want to know.) You wouldn’t expect a drug kingpin who wins a kill-or-be-killed power struggle to drive a Pontiac Aztek that’s the color of the surrounding New Mexico desert and missing a wheel cover. But then you wouldn’t expect that drug kingpin, Walter White, to have started out as a solid-citizen high school chemistry teacher anxious to build a nest-egg for his family after he’s diagnosed with a terminal illness. Walter’s former-student-turned-accomplice, Jesse, transports his increasingly desperate self around in a faded, sagging Toyota Tercel wagon. Then there’s Mike, the cold-blooded “security chief” for Walter’s frightening rival, who maintains a fleet of Eighties and Nineties “granny” cars—easy to buy, easy to miss, easy to lose. Like the arc of Walter White’s life, the show’s cars just seem to go from bad to worse. Don’t think it’s easy putting characters in Dreckmobiles, either. As Breaking Bad transportation coordinator Dennis Milliken recently told Entertainment Weekly magazine, “I’ll send [show creator Vince Gilligan] dozens of pictures, and eventually we narrow it down to what he thinks the character should be in.” Then the search begins. And so, back to the original question. The opposite of nostalgia? I’d like to nominate Family Matters klutz Steve Urkel’s Isetta. Written by: John Biel on August 18, 2012.on March 27, 2018.